Want higher yields? Grow light movers could be quite literally the right track to getting the most out of your lights, your grow space and your plants. Read on to learn more and discover the best grow light movers currently available. 2 What are grow light movers? 3 What types of light movers are available? 4 Why use a grow light mover? 5 What are the advantages? 6 Are there any drawbacks? 8 Can I get a light mover instead of a second light? 9 What are the best grow light movers? 9.1.1 But where to start? Grow light movers ensure that light is distributed evenly across the whole grow space to penetrate further beneath the canopy and reach more leaves on your plants. As the name suggests, they do this by moving your lights constantly back and forth across your grow space along a track or rail (or some types have a circular motion). Because your lights are now constantly on the move, you can now get them even closer to your plants without worrying about hotspots, light burn or excess heat—which means your plants can absorb even more of the photons your grow lights are throwing out. 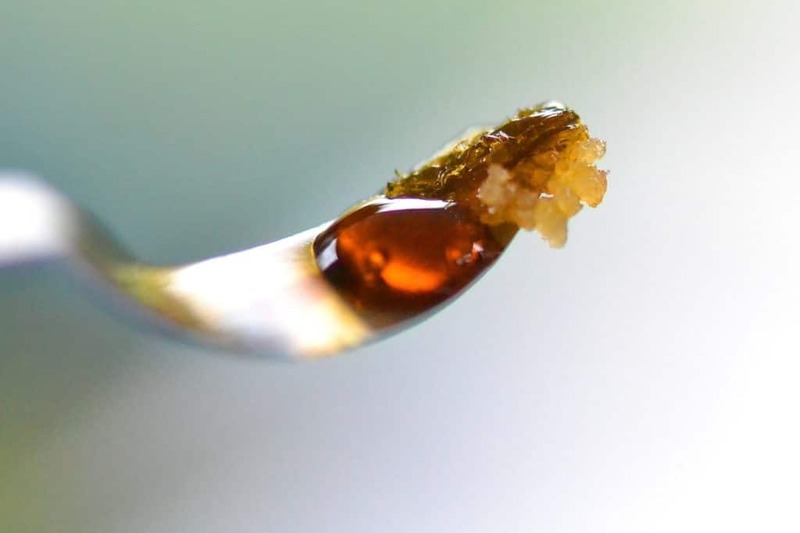 Healthier plants, more bud sites, more energy stored up in the leaves ready for flowering, higher yields—and not to mention much better bang for your buck! In this article, we’ll explain more about how light movers work, what types are available, why they outperform static light sources and what to look for when buying. And if you’ve only seen light rails used in commercial grows before, don’t worry. They’re not just for commercial growers. Home growers can benefit too. Some can even be used in a grow tent. Want to skip straight to the reviews? Just click here. What are grow light movers? Let’s say the light does a complete back and forth along the rail. Plants in the middle of the footprint will still have received a bit more light than those at either end—i.e. exactly the main problem you installed it to solve in the first place! Which is why any decent light mover also has a delay built in. In other words, to compensate for that extra time in the middle, the lights pause briefly at each end of the rail. If you’re using a model where the length of the rail or how far the light travels is adjustable, the delay time is usually also adjustable. However, single tracks are not the only option available. Nor are linear tracks or rails. What types of light movers are available? Linear light movers are the most popular and widespread. Many can move more than one light on the same track or rail. Equally some growers may set up multiple parallel tracks. But given the home growing laws in most states, most home growers aren’t likely to need more than one. As we mentioned above, the other main type of light mover has a circular motion, somewhat like a ceiling fan. The light or lights rotate on the end of an arm or arms. Alternatively, the mover might spin 180 degrees in one direction, then back again. Rotating, circular or rotary grow light movers, however, can be a little more difficult to set up. For one thing, there’s the trailing power cords from each light, which you’ll have to make sure are correctly routed to ensure safe, tangle-free rotation. Instructions on that are usually provided of course, but it’s still easy to make a mistake here. Why use a grow light mover? In short, to get much more out of your existing setup. A light mover can significantly extend the footprint of your existing light, improve penetration below the canopy, ensure more and better light reaches all parts of the grow space and can ultimately increase yields by as much as 20%. They can also save you some money in the short and long term. For instance, even if you take manufacturer claims with a big pinch of salt, you can see how significantly extending footprint could save you the expense of buying an extra light or a bigger light. In addition, higher yields, more efficient use of space and more efficient use of your light(s) should lead to lower running costs in the long term. Finally, there are some major disadvantages to growing indoors with a static light source vs. growing outdoors with natural sunlight. Which using grow light movers can eliminate or greatly reduce. Grow lights, of course, are used in indoor grows to replace the sun. However, unlike grow lights, the sun is not a static light source; it changes position constantly throughout the day. Consequently, sunlight reaches outdoor cannabis from all sorts of angles and directions. Which means a lot more of an outdoor plant will receive good quality light during the course of a day, and a lot less of the plant will spend time in shade, compared to a cannabis plant grown indoors. A fixed light source, on the other hand, can struggle to sufficiently nourish the lower parts of the plant. Unless you use plant training methods to expose more of it to the light. Also, plants at the edge of your grow space get less intense light and consequently will tend to stretch inward toward the center. Growth can be very uneven. Both HID and LED grow lights can suffer from hotspots—areas of coverage that are much more intense (or even too intense). With an HID that would be the area directly below the bulb. These intense hotspots necessitate hanging the lights higher above your plants than is strictly optimal, reducing both light and energy efficiency. The solution to these problems? A light mover evens out both kinds of hotspots—no part of the plant stays too long under either intense light or intense heat. Light and heat are distributed much more evenly across the whole grow space. Meaning you can hang your lights much closer to your plants without overheating them or causing light burn—i.e. parts of the plant receiving more photons than they can absorb. The closer to the plants your lights are, the greater the amount of photons they emit will actually reach your plants. And the more value you’re getting out of them. An additional benefit: Spreading the heat also creates better airflow, which is great for plant health. So that’s more energy the plants can store up for flowering, more quickly. Healthier plants. And ultimately, higher yields. Since your plants will receive their optimal daily light intake—or Daily Light Integral (DLI)—more quickly with a light mover, you may even be able to reduce running costs by running your lights for fewer hours per day. Or you might downgrade to a less powerful lamp and save running costs that way. Faster growth rate also equals shorter grow times. Add those benefits to higher yields and being able to extend your footprint without purchasing an extra light, and you can see how a light mover could pay for itself in the short and long term. As you likely already know, plants don’t just absorb light and store it as energy. They also react to it. For instance, by growing in the direction of the light source. In particular, they respond in various ways to the ratio of red light to far-red light wavelengths they receive. A plant or part of a plant in shadow gets a low red to far-red ratio. From this signal, it ‘knows’ to stretch, to grow taller, to move its leaves closer to the light. With a static light source, shadow patterns don’t vary. With a moving light source, however, shadow is always shifting. The angle of light is constantly changing. Meaning the average ratio of red to far red all parts of the plant receive is naturally a lot higher than with a stationary light. Leading to less stretching, less space between nodes, stronger, thicker stems and more even growth. In short, much healthier, more even growth and more penetration below the canopy. Finally, another benefit of a moving light source and so-called ‘shadow shifting’ is that you can grow your plants a little closer together, allowing for more efficient use of your grow space. Are you any good with DIY? If assembling a grow tent is about the limit of your comfort zone, or you don’t have much access to the right tools, a light mover might not be for you. However, if a bit of cutting, drilling and measuring doesn’t faze you, great—that’s the major dealbreaker taken care of here. You’ll need to find another outlet to plug it into. We could also have mentioned that a light mover is another thing drawing power… But the power draw is actually pretty minimal. And as we’ve already discussed, those costs are likely to be more than offset by other advantages. Finally, as obvious as it sounds, check that the power cord on your light is long enough that your light can travel back and forth without coming unplugged! The best light movers feature a delay. A linear light mover without a delay is still better than a static light, if that’s all you can afford right now. But coverage won’t be as even. Can I shorten the rail or run length? How? In some cases, the track might be modular. In others, you can set how far along the rail the light will travel. Or you might have to cut the rail down to the size you need. If length is adjustable, is the delay adjustable? Different lengths of rail will require shorter or longer pauses at each end. If I decide to extend my grow space at some point, can I extend the track or add lights? Some kits allow extra track to be added, or end points to be adjusted. Some make it easy to add extra lights to the existing track. Rotary light movers often come with different arms and/or arm configurations that can be added to the same fixture as needed, depending how many lights you want to use. 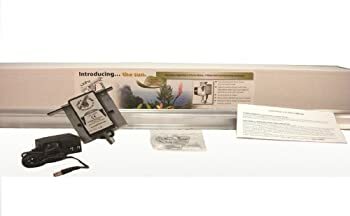 The best grow light mover kits are highly customizable. How heavy are the lights I want to use? How heavy is the light mover? Can the mover carry your lights? (Most will carry plenty of weight, but it’s still worth checking.) And most importantly, can the ceiling/beam/frame you’re attaching it to take the combined weight of the light(s) and mover? Are you stealth growing? Or just not fond of noise? Some models are much quieter than others. What’s the motor speed? Is it variable? If the track length is variable, you may need to vary the speed the light travels up and down it too, so as not to keep your plants waiting too long for the light to return. 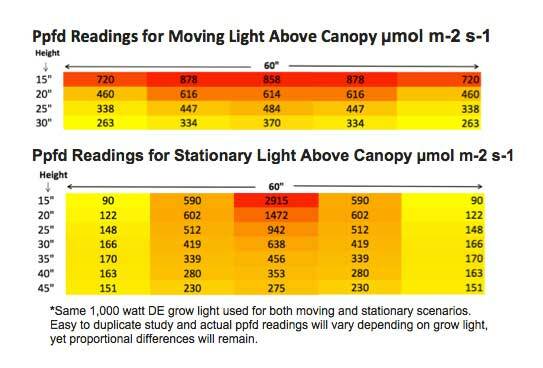 Equally, having a higher speed setting could allow you to use a more intense or hotter light without sacrificing closeness to the canopy. This isn’t quite as important a feature, however, as the delay. If you’re buying a rotary model, what area can it cover? Naturally, rotary models have a fixed circumference. More powerful lights may expand that, but a limit will be reached. Is it suitable for a grow tent? Can you get a grow tent adapter? Not all movers can be attached to a grow tent. However, some are more flexible. While the default is often still to attach it to a ceiling, grow tent adapters or frames may be available. With light movers, it’s worth bearing in mind that higher prices tend to translate into higher quality materials, better build quality and greater durability. In cheaper light movers, for instance, cheaper bearings are used in the tracks and can wear out more quickly. Can I get a light mover instead of a second light? First of all, it depends on the size of the area you want to cover. You might well be able to grow an extra plant or two just by adding a light mover. But pay attention to how much the manufacturer claims the mover will extend your light’s footprint. For instance, one major brand claims 30% more horizontal area per grow light. And don’t try to move a grow light too far. If you have one light on too long a track, you risk making plants wait an unhealthy amount of time for light to return. Based on the 30% rule of thumb, a couple of feet of movement in total is recommended for a smaller light, for example. (That may not seem much. But remember, half of the grow light will extend beyond the end of the track—and its footprint even further.) Three feet would be realistic for an average size light. While a four feet run could work for the largest lights. Finally, if maximum yield and reduced grow time is the main priority, and if you can afford it, then it could well be worth investing in both a second light and a light mover. What are the best grow light movers? Now you know all about the types of grow light movers available, the pros and cons and what to consider when choosing, let’s take a look at some of the best grow light movers currently available. We favor the simplicity, flexibility and versatility of linear grow light movers, so we’ll focus on those for our choices. In addition, we’ll be bearing in mind readers with different sizes of grow space and different wallet sizes. And we’ll be sticking to what’s widely available in the US (which rules out Jupiter II light movers, for instance). So hopefully all of you will find a suitable option here. And if you don’t, just leave us a message in the comments and we’ll try to help! In truth, there is really only one big name in grow light movers at present: LightRail from Gualala Robotics. Copycats and budget options exist (see below), but most of them are virtually identical to each other, and a number of lesser brands seem to have fallen by the wayside in recent years. Well, LightRail movers are just better. Period. Higher quality, USA-made, versatile, flexible, solid and hard-wearing. So for many growers, even the existing cheapo, generic systems aren’t that attractive. While you save a bit of extra cash short term, the trade-off in quality and product lifespan just isn’t worth it for most. Because one of the big advantages of LightRail systems is that they’re made to last—in every way. As well as being hard wearing, they’re also easily expandable and upgradeable and all parts are replaceable. So if you want to expand your grow op, you won’t need a whole new light mover system—just upgrade the LightRail you already have. You can easily add lights, add new track, upgrade the motor, replace anything that wears out. No built-in obsolescence here. 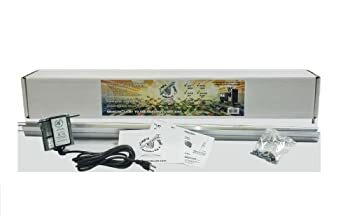 The LightRail 3.5 grow light mover system is the cheapest, entry-level model available from Gualala and should suit the majority of indoor growers—grow tent, grow room or greenhouse. The complete kit consists of a two-piece two-meter (6’6”) rail, a 10RPM motor, installation hardware, a 2-year warranty and clear, detailed instructions (PDF). If you’ve got a relatively tight grow space, you can use just one half of the rail, and it’s up to you where along it you place the stopping points. The motor will move your light along your chosen distance at a fixed 4 feet per minute. However, delay is adjustable, from 0 to 60 seconds, to ensure your light pauses long enough at each end to give even coverage. Without any upgrades or extras, the LightRail 3.5 will expand a 4’x4’ light footprint up to 4’x8’. Upgrades and extras include Rail Hanger Brackets for easy mounting on grow tents and in greenhouses and the Add A Lamp kit to allow driving up to 3 lights per rail. The basic kit will support 35lbs of lights, so if adding extra lights takes you above that weight, you might also need the Extreme Duty Trolley Wheels upgrade for heavier lights (up to 60lbs per set). These have a lifetime warranty. The system draws only 5.5W at the wall. So you can see why we said earlier that running costs are negligible and likely to be covered by improved yields and better light performance. Not many. If you want to run two lights next to each other, rather than in-line, you’ll need to run two parallel tracks. It doesn’t work on 220V electricity systems. And for larger spaces, having an adjustable speed motor would be handy…. Which is where the 4.0 model comes in. The LightRail 4.0 AdjustDrive Kit is much like the 3.5 but has an adjustable speed motor (2 to 4 feet per minute) and can work on both US and European electrical systems. While the 3.5 will suit most growers, we’ve chosen the 4.0 as our Editor’s Choice because the adjustable motor speed offers that extra bit of flexibility. Being able to control both the delay and motor speed settings means you can get the most out of grow lights of all different intensities on a wider range of different track lengths. So this system could see you right for years, as you improve your growing and upgrade lights. If you already have the 3.5 Kit and you want that extra customizability, no problem, you can keep your existing setup and just upgrade to the 4.0 AdjustaDrive motor. The only real downsides to the 4.0 or 4.20 LightRail Kits are that a) electricity consumption is higher (9W); and b), like the 3.5, running lights in parallel rather than in-line means running them on separate parallel tracks. 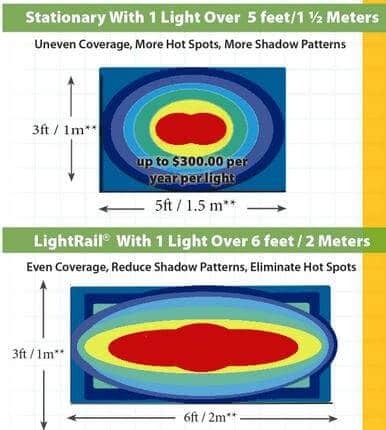 The LightRail 5.0 Kit is Gualala’s top-end commercial grow light mover system. Most of our readers won’t need it, so we’ll keep this summary short. LightRail 5.0 can carry up to 100lbs of lights per crossbar and in various configurations, including side-by-side, fore-and-aft and combinations thereof. One system, with its high torque 4RPM motor, can carry up to 9 lights. Besides the even stronger construction—backed up by a limited lifetime warranty—and crossbar options, the other main differences here are that the 5.0 comes with a two-piece 8-foot track as standard, motor speed is non-adjustable and electricity consumption is lower than the 4.0 and 4.20—just 5.5W. Apart from the added expense, the main downside to the 5.0 is that it’s not backwards compatible with the older models. Also, crossbars make things a little more complicated—such as balance, or accommodating vent tubing when using HID lights. An adjustable motor speed might have been good too. But arguably the 5.0 is intended for a more specific use scenario (commercial high intensity lights as standard), so the more limited customizability is an acceptable sacrifice. A few cheaper options are available on Amazon and eBay if you’re on a really tight budget, but we don’t particularly recommend them—and nor do a lot of the customer reviews. While there are a few different brand names out there, when you look closely, the actual products all look virtually identical. The mover comes with a two-piece 7’ rail, that you can also cut down to size, a 10RPM motor and adjustable delay settings (0 to 120 secs). So we’re guessing that these are all basically the same product, made by the same factory, but white-labelled by different sellers. Of these identikit movers, at present the Growsun Adjust Drive Motor Light Mover Kit has the better customer reviews. 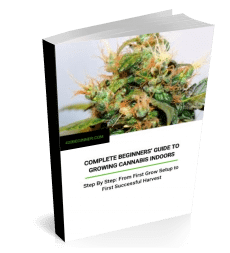 Growsun has a largely positive history on Amazon, too, and is also a seller of various other cannabis growing equipment. So, of the budget options, at the very least you’re likely to get better customer service from these guys. However, we still prefer the LightRail 3.5 to any of these cheaper light movers. Grow light movers get your lights as close to your plants as possible, extend and even out the footprint, lower your lighting costs and increase yields. And they’re surprisingly affordable too—especially compared to upgrading your lights or buying additional ones. Well within the budget of most home growers. If you want to get the most out of your existing lights and grow space, they could be exactly what you need. Just look for LightRail from Gualala Robotics and choose the system that best suits your setup and budget. And for even better results, try combining a light mover with plant training techniques. Have you used grow light movers? Is there one you’d recommend that we haven’t covered here? Any tips? Let us know in the comments!